Huawei P30 Pro release date revealed and design leaked: the camera phone to beat? The Huawei P30 Pro is coming soon, packing all sorts of imaging technology. The Huawei P30 Pro release date has finally been revealed by Huawei but perhaps not in a way you were expecting. It's no secret in DCW towers that we love the Huawei P20 Pro's camera capabilities, you only have to look at our best camera phone guide to see it riding high. But it's a phone that's nearly a year old now and the likes of the Google Pixel 3 and the bigger-screened Huawei Mate 20 Pro are giving it a run for its money in the imaging stakes. That's all set to change, though, with the launch of the Huawei P30 Pro - a launch which is set to mirror the P20 Pro by happening in March and being in Paris. This is according to a press release that went out by the company in Poland, which was primarily about the company doubling its workforce in that area. But at the bottom of the release(translated), it also noted that its flagship phone, the Huawei P30 Pro will be coming in March. Alongside this official reveal, there has also been an unofficial look at the new handset, thanks to case maker Spigen (which was picked up by GSM Arena). Although the design is unverified, these new renders show off a handset that comes with a whopping four cameras in a vertical array on the back of the device. Adjacent to this is dual LED flash. This is contrary to earlier reports that there would be a rather more unorthodox lens setup. 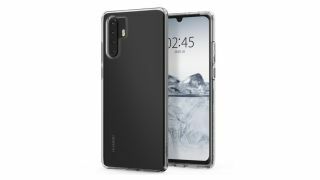 These renders look much more likely to be the real deal and it's though that the plain ol' Huawei P30 will have a three-lens setup. There's no word on the lenses but previous leaks suggest that we should see a 38MP camera with a larger sensor, which is actually fewer megapixels that can be found in in the P20 Pro. Fingers crossed the monochrome sensor will also make a return. Interestingly, this is another render that has the P30 Pro with a dewdrop front display and not the punch-hole design that the likes of the Honor View 20 has opted for.